I couldn't let machine-metronomic-electronic masters, Kraftwerk pass through this city of the industrial revolution without a visit and review, especially given this blog is named after a vintage electronic instrument after all. 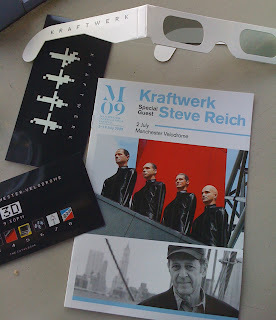 I've been a big fan of this lot for more years than I'd care to mention now, although in many ways, more the very early stuff from Kraftwerk I and II. I've also got a lot of time for Steve Reich, especially the Kronos Quartet and Metheny's 'Different Trains' album which gets a regular outing on my iPod. There's been a great sense of excitement around the Manchester International Festival this year, building up a head of steam going into last night's gig at the unusual and highly appropriate Manchester Velodrome cycling centre. 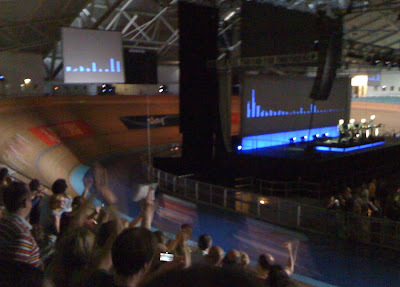 Kraftwerk are big cycling fans, and the Tour de France starts tomorrow, so it all makes perfect sense. The excitement is palpable on twitter #mif09. On walking into the velodrome I was immediately impressed with the setting, but did wonder how Reich's minimalism would come across. What we actually got was 'Bang on A Can All-Stars' performing a new Reich piece, '2x5'. Anyone hoping to see Mr Reich would have been disappointed, but the music was undoubtably excellent being some of the best of his stuff I've heard. The delivery in rock convention mode of two electric guitars, electric bass, piano and drums worked extremely well. It was obvious that many at the gig were really there for the main course, but it made a decent impact even so. After a short break and with 3D glasses at the ready (given to us when we arrived), a deep bass synth throb and red man-machine screen projection got us lined up. 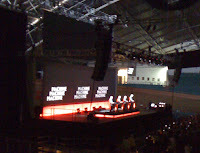 The curtain pulled back to the opening bleeps of 'The Man Machine' and so there they were in classic Kraftwerk straight line podium configuration. Germanic black attire and russian constructivism aesthetic projections made for a quite overwhelmingly impressive effect, Kraftwerk no mistaking. Onwards we were taken on a no nonsense tour de la Kraftwerk classics, all accompanied with sartorially and visually authentic accoutrements. On 'Tour de France' we got an extra treat with the olympic gold cycling team appearing onto the velodrome circuit and giving us a few laps. 'The Model', as always, was charming. After a short curtain call, the skinny robots appeared for a great version of 'The Robots'. It was then 3D glasses on so we could take in the numeric eins-zwei-drei projections of 'Computer World'. The 3D effect didn't always quite work where I was stood at least, but on many tracks it was quite amazing. 'Computer Love' was endearing and 'Trans-Europe Express' was suitably cruising. The sound overall was spot on, with the pin-point precise arpeggiated lines all coming across cleanly. The 3D projections on 'Vitamin' were especially impressive. Some of the latter tracks off 'Electic Cafe' weren't quite so effective perhaps, but it was still quite an incredible concert. The efficient one-by-one exits by the group to 'Musique Non Stop' was fitting. You know these fellas don't do encores.